A simple extension to Dropbox Uploader that provides a convenient method to share your Dropbox files with one click! 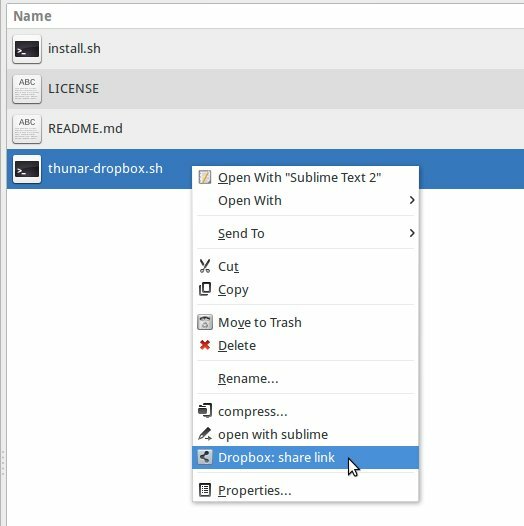 This plugin works if you have your Dropbox folder located in standard path ($HOME/Dropbox). If not, create a symlink (ln -s). 1. In order to get a link, right click on a file and choose “Dropbox: share link” option. 2. You should see a notify-send popup with information about ready-to-share link. 3. Your link has been copied to your clipboard! NB: it takes about one-two seconds to generate the link, so don’t immediately try to paste the link! for some unknown reason Dropbox-Uploader sometimes gives “FAILED” result instead of a link. This is not a script specific issue and in such scenario, simply try again. Dropbox Uploader is a BASH script which can be used to upload, download, delete, list files (and more!) from Dropbox, an online file sharing, synchronization and backup service. It’s written in BASH scripting language and only needs cURL. Portable: It’s written in BASH scripting and only needs cURL (curl is a tool to transfer data from or to a server, available for all operating systems and installed by default in many linux distributions). Secure: It’s not required to provide your username/password to this script, because it uses the official Dropbox API for the authentication process. Please refer to the <Wiki>(https://github.com/andreafabrizi/Dropbox-Uploader/wiki) for tips and additional information about this project. The Wiki is also the place where you can share your scripts and examples related to Dropbox Uploader.